Lately on average patients or patient relatives contact me about stem cells more than once a week. That’s about 50 times a year. The patients or their parents have questions about stem cells most often. Sometimes they have comments about this blog. Other times they ask for medical advice from me. Because I am a Ph.D. scientist I do not ever give medical advice, but I often have fruitful discussions with patients about stem cell science and the realities of stem cell interventions. The most frequent kind of contact I have is with parents of autistic children. The second most common contact is made with me by patients who themselves have Multiple Sclerosis (MS). Many other diseases come into play as well in these contacts. The parents of autistic children are often desperate for some kind of hope and are exploring stem cell therapies. Often they ask me for recommendations for specific clinics or my opinion on “which type of stem cell is best for autism”. I do not believe that any stem cell treatments by any stem cell clinics currently offer any realistic hope for treatment of autism. So to be ethical I must tell them that, but I try my best to be understanding and supportive at the same. I also tell them about my concerns about safety. I also tell them I have doubts about the clinical trial ongoing for autism with stem cells. Finally, I tell them there is hope for the future for the use of stem cells, but it is still early days for the field. The same kind of situation holds true for how I discuss things with MS patients. I just do not believe that IV injections of stem cells realistically do anything that has been proven to be good for MS patients. Here again there are safety concerns. Perhaps at some point stem cells will in some form be shown to safely help MS patients, but that is not true today. I point them towards my top 10 list of questions that they should ask doctors and clinics selling stem cells. See the list in summary form above that can be printed and taken with you to the stem cell clinic. In both the case of autism and MS (as well as other diseases) I point out that clinical trials are available, but I also stress that clinical trials have risks too. At least, however, an FDA-approved clinical trial usually means patients will be treated with respect, not charge exorbitant fees, and will receive proper follow up by a trained physician. I also point out to potential stem cell patients that by traveling to other countries they may increase their risk or the risk to their children because regulatory laws are weaker in most places outside the US. In many countries there is no such thing as malpractice law either and many clinics have no contingency plans for what do if something goes wrong such as if patients become septic or have catastrophic autoimmune reactions. I have thought long and hard as well as gotten outside expert advice about how best to be supportive of patients without giving medical advice. I believe the approach I described above is the best even if it is imperfect and still evolving. In the end I hope through these overall educational efforts and my being a respectful listener that I help patients and their families overall. First of all, I would like to say that I fully agree that there is no approved stem cell treatments for any illnesses you listed above and usually, I find your writings interesting. However, by your writing above, I feel you simply imply that your scientists colleagues doing currently clinical trials e.g. for MS with MSCs in the USA and UK are scams as they should even know better than you do that MSCs for MS are not efficacious. We all know that many of these trials were already done several years ago abroad. Can’t these scientists read the results of those clinical trials? So why are they waisting money on repeating the very same trials? …By the way, previous clinical trials with small group of patients showed limited efficacy for MS with MSCs as opposed to no-efficacy you said in your previous writings. I appreciate your educational efforts in this forum, but I feel your efforts fell short of giving proper information and explanations and some times your arguments are just not well founded and they are one-sided. Sometimes, your arguments even go against the interim results of clinical trials. If I am correct, your research area is not MSCs, so it would be really great if those specialists would be heard who are doing research (e.g. 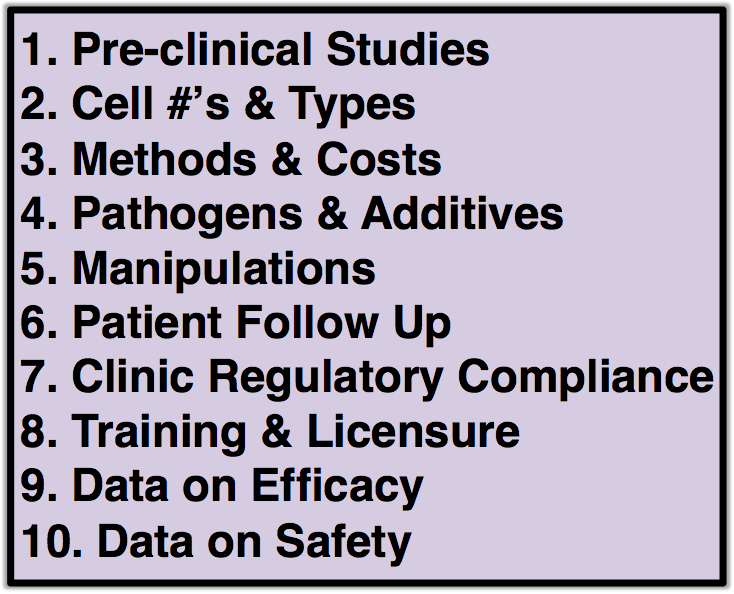 clinical trials) with MSCs for a specific illness when these subjects come up. Stem cell field is a very large area, not to mention the variety of illnesses they try to treat. So, no one can be expected to be an expert of all, however, it can be expected to hear the voices of those who have more experience in the specific field. This is a scientific blog if I am correct, so it would be interesting to see how MSCs are working pros and cons in MS for example and how the new stem cell lines might differ from these (trans-differentiated MSCs, hESC derived MSCs, iPSC derived MSCs). There are well known scientists in the USA who work in those fields. Even though MSCs are one of the few stem cells that are currently in clinical trials I find very few and very superficial writings about them in your blog. Mostly, that they are dangerous and not efficacious. I think many of us would be interested in the science behind these stem cells. Science is a messy business. Mistakes are common — even though motives be pure and expertise substantial. It’s a story of always cross-checking with other results/theories and testing and re-testing. Most of the greatest advances happened by reconsidering what we once thought to be “true” — much of the rest by pure persistence and luck. thank you for your comment. I share your view that repeated trials might yield some benefits in the future. On a different note, I wanted to point out that with all due respect for Paul’s educational efforts here in this site, the information presented on MSCs are just not representing all angles of the real story. I got the impression here that MSCs are totally ineffective for example for MS patients and they are even dangerous. That is not true. Distinction is not made between non-culture-expanded MSC treatments done by quacks ( this is really snake oil) and the culture expanded MSC treatments. The latter is in clinical trials. Also, several clinical trials have been completed with culture expanded MSCs in the past 7 years. Much experience has been accumulated with them. They are as safe as many approved drugs. Saying that no stem cells migrate to the injured site is just not true based on the results of the clinical trials. Why the results are just partially positive and how and to what extent do the MSCs take effect would be worth some analysis. E.g. autologous MSCs are not identical, different people have different quality of MSCs, different persons’ MSCs contain different quality and amount of hepatocyte growth factors. So, instead of repeating all the time that MSCs are dangerous and not more than snake oil I would like to read about real science and statements should be substantiated by facts. If they are not efficacious at all, reference to clinical trials should be made or to researchers who did such trials. Many animal studies and several clinical trials have been completed so far. How do they work, what are the experiences with them, why are they work for one person and not for the other, what factors do they secrete, etc. There are experienced researchers in the field at Case Western, University of Cambridge, Hadassah Medical Center, just to name a few. Also, I only read a disparaging comment on Lanza’s hESC MSCs. I would think that his results would deserve more than that. Also, nothing can be read about trans-differentiated MSCs, even though, clinical trials started at Tisch of NY. How much might these be more efficacious than BM derived MSCs? How much do they work differently than BM derived MSCs? At the Parent’s Guide to Cord Blood Foundation I get similar inquiries, although mine are usually more focused towards “Can CORD BLOOD treat [name the condition]?” I have a web page that lists all the conditions currently in clinical trials, and I refer readers to that. When I am stumped, I turn to my Panel of medical advisors. For example, parents have contacted me about very rare genetic conditions that are similar to something that is already treated, and I really don’t know whether they can be treated unless I consult a genetic counselor and a hem/onc who does transplants. For neurologic conditions I have a neurologist. Now, I am incorporated as a charity, and I was under the impression you are not, but nonetheless if your blog generates so many inquiries you should consider creating an expert panel to help you with this. Maybe the 3rd times a charm! Ha! I tried to comment on the LinkedIn discussion you posted in, but it kept cutting my comment off after the 1st sentence. What I was saying…We at patientsforstemcells.org get up to 10+ patients a week asking for information. We do not advise on any one clinic or any one treatment protocol as every disease/condition is so very different. As you do, we have them think about many of the top 10 questions you posted above. Most of the patients that contact us are “No Option’ patients who have exhausted all forms of FDA approved therapies, and are now looking into alternative treatments. This is an obvious reason that the medical tourism industry is alive and thriving. Since the FDA regulated that cells=drugs, I can only predict that medical tourism will become even more popular after positive patient outcomes. Quality of life improvements is all most of us are looking for.